Beef aging is a process of preparing beef for consumption, mainly by breaking down the connective tissue. The process changes beef by two means. Firstly, moisture is evaporated from the muscle. The resulting process of desiccation creates a greater concentration of beef flavour and taste. Secondly, the beef's natural enzymes break down the connective tissue in the muscle, which leads to more tender beef. Wet-aged beef is beef that has typically been aged in a vacuum-sealed bag to retain its moisture. This is the dominant mode of aging beef in the U.S. and UK today. It is popular with producers, wholesalers and retailers because it takes less time: typically only a few days and there is no moisture loss, so any given piece of meat sold by weight will have a higher value than a dry aged piece where moisture loss is desired for taste at the expense of final weight. The beef is usually kept for a period of 4 to 10 days in wet aging. Modified Atmosphere Packaging (MAP) is usually employed for the vacuum packaging of meat typically between 60 and 80 per cent oxygen to retain its appetizing color, with red meat such as beef needing a higher oxygen level than less vividly colored meat such as pork.. The vacuum packed beef are stored under a temperature of 32 °F to 45 °F (0 °C to 7.2 °C). ↑ DeGeer, S. L.; Hunt, M. C.; Bratcher, C. L.; Crozier-Dodson, B. A.; Johnson, D. E.; Stika, J. F. (2009). 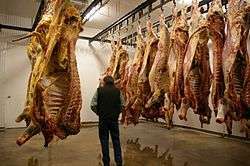 "Spotlight on dry aging beef: Effects of loin type, aging methods, and aging time". Kansas State University. Agricultural Experiment Station and Cooperative Extension Service. Retrieved 2013-03-14. Ahnström, M. L.; Seyfert, M.; Hunt, M. C.; Johnson, D. E. (2006). 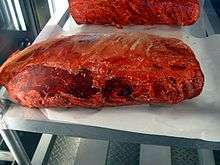 "Dry aging of beef in a bag highly permeable to water vapor". Meat Science. 73 (4): 674–679. doi:10.1016/j.meatsci.2006.03.006. DeGeer, S. L.; Hunt, M. C.; Bratcher, C. L.; Crozier-Dodson, B. A.; Johnson, D. E.; Stika, J. F. (2009). "Effects of dry aging of bone-in and boneless strip loins using two aging processes for two aging times". Meat Science. 83 (4): 768–774. doi:10.1016/j.meatsci.2009.08.017. "Almost EVERYTHING You Need To Know About Dry Aged Beef!". Ask The Meatman.